Brands are working hard to meet a resounding customer demand for an experience that is relevant and personal to where they are in their engagement with brands. Ninety percent of marketers say understanding how users engage across channels and devices is vital to success. 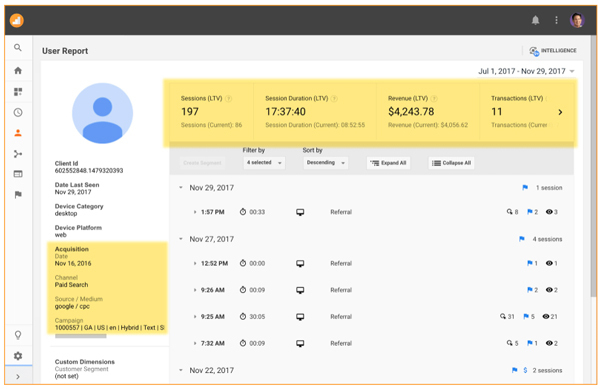 In response, Google Analytics has announced four new features to better measure the customer journey. 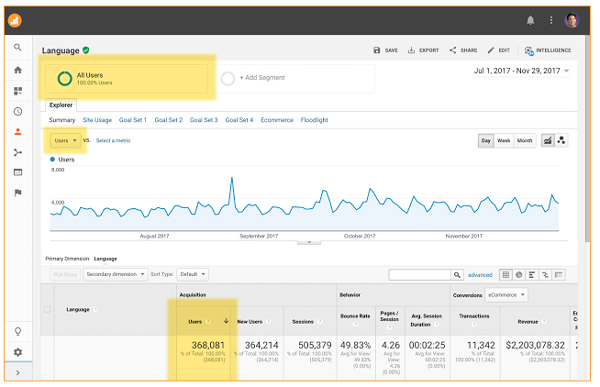 The new version of standard reporting will now also include â€œUsers,â€� instead of just â€œSessions.â€� This reframes the data for ongoing engagement focus, especially for instances where users visit multiple times, as opposed to just a total number of sessions. Prior to this update, you had to build custom reports to get a good picture of user data. User data can be further analyzed in other reports such as Active Users, Cohort Analysis and Lifetime Value. 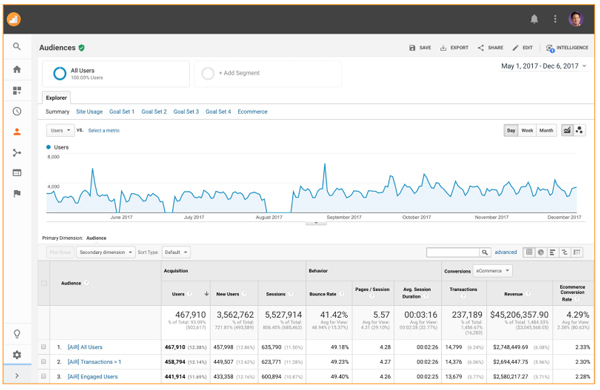 The new User Explorer tool allows marketers to view the lifetime metrics and dimensions at the user level. Based on the life of their cookie, this will open up new details to marketers, such as the number of transactions made or total time spent on the website. Data for this report is available starting from March 9, 2016, and uses the top 10,000 users. Previously, Audiences could be created and published to other platforms such as AdWords, but there was no way of doing so in Analytics. 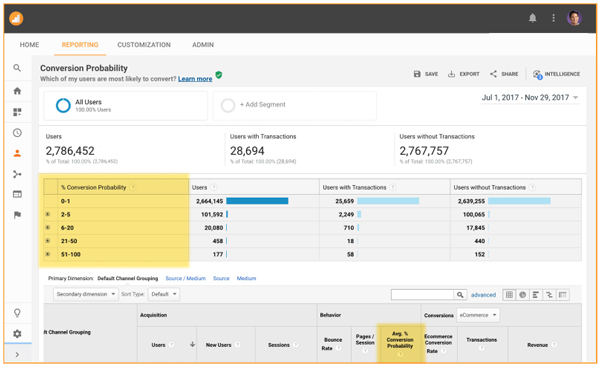 There is now the option to publish Audiences to reports, allowing marketers to see a cross-channel view of them. They can be added as a secondary dimension in reports and as a dimension in segments, custom reports and custom funnels. See the support page for more specifics on the requirements and setup of the Audience report. Based on the same machine learning that powers Smart Lists and Smart Goals, this calculation applies data from past transactions in order to give the probability that a user will convert in the future. Average Conversion Probability will be calculated related to a dimension in the date range you specify. The minimum data threshold for calculating conversion probability is initially 1,000 a month, and then 30 days of data to model accurately. The score runs from 1 (least probable) to 100 (most probable). The ability to segment these potentially-converting users gives marketers the power to target these users specifically in their remarketing campaigns on AdWords and DoubleClick. This will then give the option to bid more aggressively on them or send those users to specialized landing pages. Conversion Probability is rolling out in beta to all accounts over the next few months. Finally, a new Conversion Probability report shows the Probability for all of your users across important dimensions such as channel. Additionally, marketers can publish those audiences to Google Optimize to get insights on site optimizations that could have the highest impact on conversions. Opinions expressed in this article are those of the guest author and not necessarily Marketing Land. Copyright 2017 Third Door Media, Inc. All rights reserved. From http://www.marketingland.com. By Susan Wenograd.